While it would be lovely if posts like this appeared out of whole cloth on the day needed, unfortunately I have to work ahead. Cook ahead. Shop ahead. Think ahead. Write ahead. However you want to look at it; I rarely think of it as work–maybe you’d like to know that. 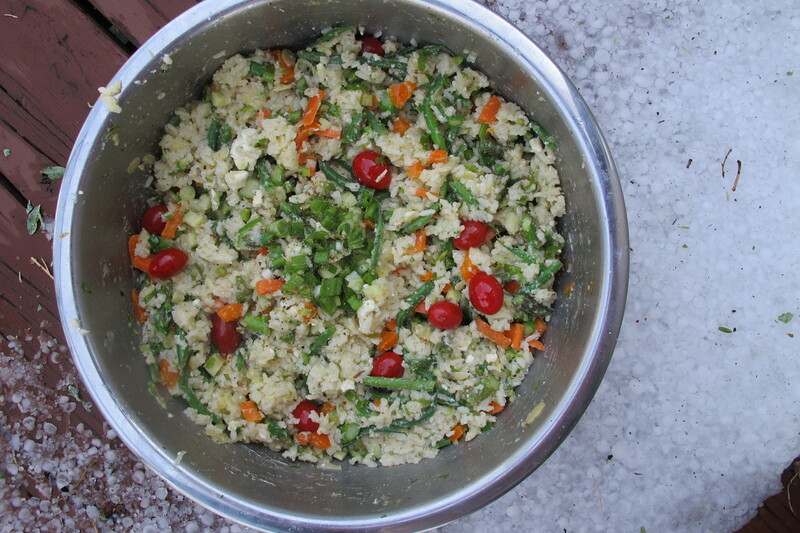 I happened to make this meal on a day when the wind whipped up like “The Wizard of Oz” and the hail beat down on our house, deck, cars, and garden with a vengeance typically saved for sledge hammering a wall you need to come down. 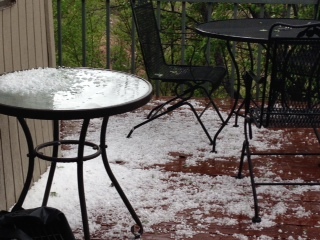 The fury and noise were enough to send the dogs and me scurrying down into the basement leaving flowers and pots and cars outdoors without further thought. Dave, just home from a trip to Lincoln, Nebraska, blithely stayed upstairs. Miss Gab’s been sick —we think an awful reaction to her Leptospirosis vaccine–but we’re still unsure. 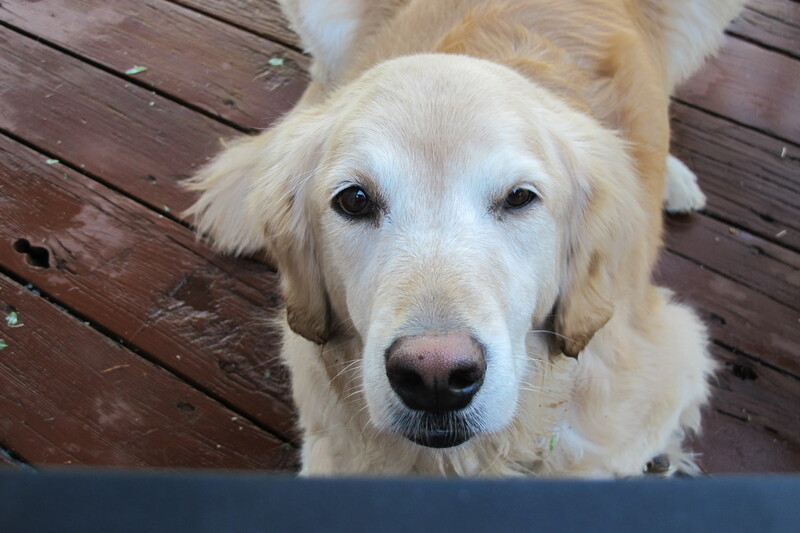 She’s getting MUCH better, but the deck full of hail and leaves was a shock to us all–Miss Gab included. Within an hour, however, the sun came out, Dave grilled the tuna for the meal on the gas grill, and we ate on the deck! While grilling tuna might not sound like the typical Memorial Day fare, it is a. healthy and b. incredibly simpler and quicker than brisket, pulled pork, ribs, or chicken. It’s faster than burgers and nearly faster than hot dogs, but if you really want the typical cook-out, check out the Food and Wine menus HERE. I picked up these wild tuna steaks frozen individually in cryopaks at our regular grocery store for $9.99 a pound or a little less than $5 for each serving. (In the past, I’ve also found similar quality and values in frozen fish case at Whole Foods.) While it’s not cheap, it’s inexpensive for good-quality fish that most people can’t afford fresh. Living in Colorado — somewhat far away from most ocean fishing areas — I often shy away from fresh fish. Read Jane Lear’s post about how great frozen fish is HERE. Make the rice salad first or in the morning and then the tuna steaks, which share the garlicky vinaigrette, practically grill themselves after everyone, including you, enjoys starters — see below — and a good chat. Wine and dessert ideas: scroll down. There’s not much you can cook that’s simpler than grilled tuna. It’s thick and boneless, cooks very quickly, and needs no fancy preparation. If you have fear of cooking fish, tuna is your best bet. Just don’t over cook it. No grill? Heavy skillets or an indoor grill pan will be fine. Heat gas grill, indoor grill pan, or two large heavy skillets over medium heat*. 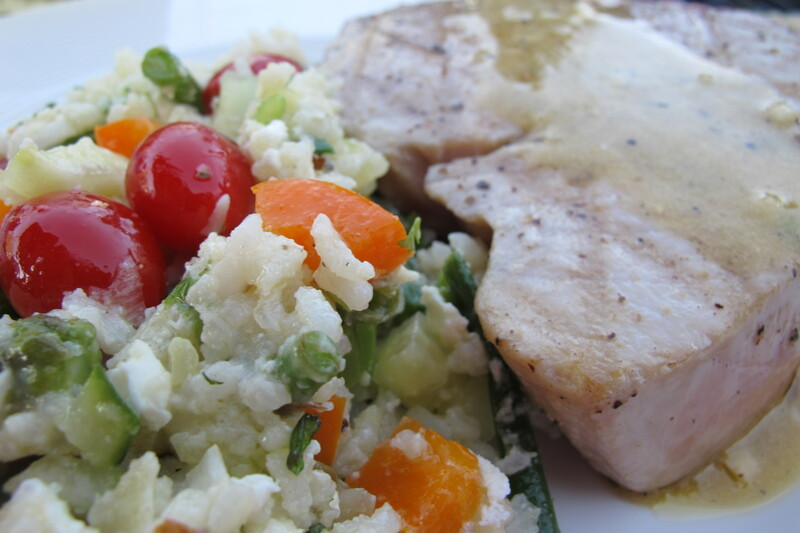 Brush tuna steaks liberally with oil and sprinkle generously with salt and pepper. Cook 5-6 minutes total, turning half-way through grilling. Tuna will be quite rare. If you’d like it less so, cook it another minute on each side. Let rest 2-3 minutes and serve hot, warm, or at room temperature garnished with a drizzle of vinaigrette. *You can also cook them about two minutes on each side over very high heat if you’d like. Dave assures me that the lower heat keeps the tuna more moist and flavorful. If you do choose the high heat option, you might want to use canola oil in place of olive oil. A quick gluten-free all-in-one side made with whatever chopped fresh vegetables and herbs you have on hand. 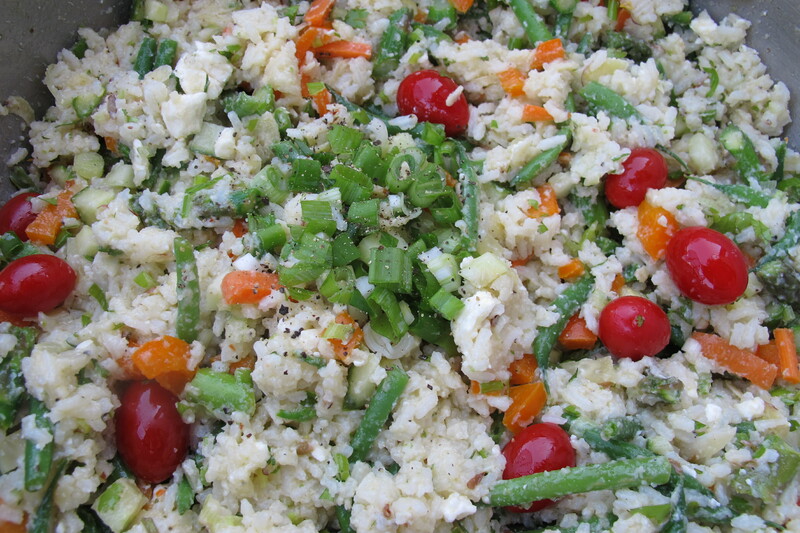 While the rice cooks, you’ve plenty of time to chop and whisk up the vinaigrette. If you have leftover cooked vegetables, this is a fine use for them and you can skip the ones listed here. Don’t be shy with the salt, pepper, vinaigrette, and other seasonings. You’ll be surprised how much it takes to make this taste like you want it to taste. One note: This makes lovely leftovers for lunches or for another grill meal. Eat up! Bring water to a boil in a 3-quart covered saucepan with 1/2 teaspoon salt and 1/4 teaspoon pepper. Add rice, cover, and reduce heat to a very low simmer. Steam should just be escaping gently from the pot. Cook 15-20 minutes or until rice is just nearly barely tender and water is absorbed. A little bite in the rice will work better here than will rice that’s cooked very well done, which will make for a mushy, though tasty, salad. In the meantime make the vinaigrette–see below. You can also use this time to chop vegetables if you haven’t yet done that. When the rice is tender, fluff it up with a fork, spoon it into a very large bowl, and drizzle two tablespoons of the vinaigrette over it. Season liberally with salt, pepper, and crushed red pepper and toss well. Add chopped vegetables, almonds, and herbs and toss again. Let sit 10-15 minutes or until cooled a bit. Gently stir in the tomatoes and drizzle with the lemon juice and another good 1/2 cup vinaigrette. Add the feta carefully, just barely mixing it in. Taste and adjust for seasonings, drizzling with a little red wine vinegar or more vinaigrette, if needed. Garnish with reserved minced scallions. Serve at room temperature or cold. If you make this ahead, save some vinaigrette to re-moisten the salad just before serving. Make sure and save some vinaigrette to top off the tuna, as well. STARTERS: It’s a really healthy, simple main course. You could start with something fun — like homemade potato chips and scratch onion dip with Gruet, a New Mexican sparkling wine. Or ask a guest to make a platter of red and blue fruit with slices of goat cheese and serve a pitcher of Sangria. If it’s hot, a big bowl of Wakefield Plantation salt and pepper peanuts and a huge bowl of popcorn brought out with huge frosty mugs of beer might be in order. WINE: I liked a big bold boardy– some would say “oaky” — California Chardonnay with this meal. If you’d like a red instead, you might try an Oregon Pinot Noir. Whatever you do, please drink an American wine for the holiday? DESSERT: Make homemade ice cream. 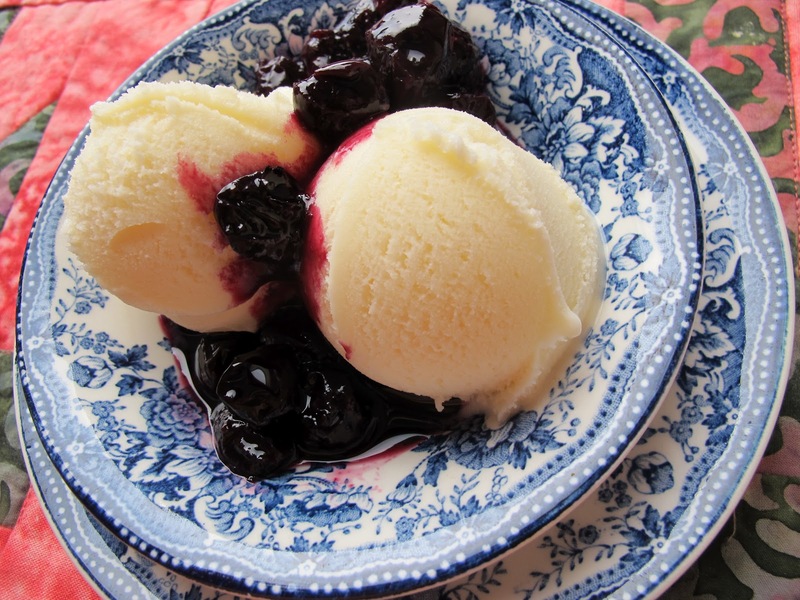 For my post on homemade Vanilla Ice cream with Blueberry-Lemon Sauce, click HERE.